Never miss a recipe or newsletter! It always falls close to the Super Bowl, so I have a little birthday/SB dinner. We were a little bummed the 49ers didn’t get into the big game. What was up with that? We have a thing for Alex Smith, since he played at the U of U a few years back. Met him a few times at games. Great kid. Oh, maybe he’s a man now? Here’s a cute pic of him with my boys at the Fiesta Bowl. Anyway. Superbowl=appetizers. A stuffed mushroom fit for the Super Bowl. Is that two words? or one? My spell check says it’s two. Are you a French Onion Soup lover? I am. Remember when I posted Classic French Onion Soup? It’s my favorite soup in the world. When I was a kid, my dad made it for us. And we had these little bowls, special for French Onion Soup, I think it was the only time we used them. Which must have been once a year? Funny how I remember those bowls. This appetizer tastes just like French Onion Soup. In a mushroom. I made these and everyone went crazy. A love fest. For the mushrooms. If your people love onions and mushrooms, you have to make these. 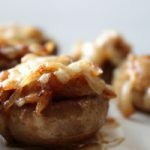 Adapted from the Pioneer Woman recipe for French Onion Soup Stuffed Mushrooms, this appetizer is every French Onion Soup lover's dream! Easy to make and a crowd pleaser. Wash and pat dry mushrooms. Pull off stems. Chop the stems into small pieces and set the mushroom caps aside. Do not chop the mushroom tops(caps)! In a medium skillet, melt 1 tablespoon butter over medium heat. Add onions and chopped mushroom stems and sauté for 15 to 20 minutes, stirring occasionally, until very soft. Add beef broth, Worcestershire, and balsamic or cider vinegar. Cook for another 5 minutes, or until liquid is cooked down. Set aside. Melt 1 tablespoon butter in a large skillet over medium heat. Throw in mushroom caps and cook for 2 minutes, just to start the cooking process. Sprinkle mushrooms with salt. Turn off heat. Place mushroom caps face down in a baking dish 9x13 or pie plate. Heap cavity of mushroom with sautéed mushroom and onion mixture, then sprinkle Gruyere over the top. Bake at 10 minutes on 325 degrees. Turn on broiler and broil just until the top of the Gruyere starts to bubble and slightly turn brown. Top with minced parsley and serve immediately. What a great idea!I should try this.Well done! I took this idea and put it on top of twice baked potatoes with provolone & roasted garlic in the potato mash. Yum. Oh and I used balsamic vinegar instead of the wine. Hi, I'm Si and this is my Bountiful Kitchen! Copyright © 2019 A Bountiful Kitchen · Custom Design and Development by McKenzie Sue.